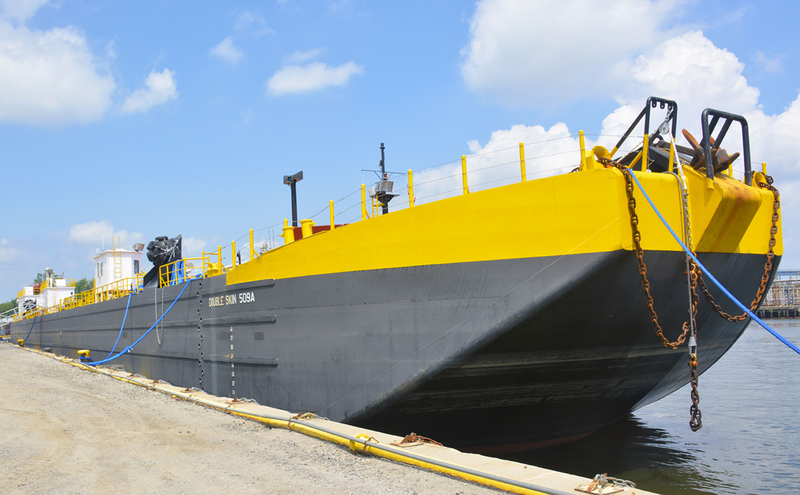 The Vane Brothers Company, a leading marine transportation provider headquartered in Baltimore, Maryland, has taken delivery of the Double Skin 509A, the company’s first new-build barge designed specifically for moving asphalt. Constructed at Conrad Shipyard’s Amelia, Louisiana, facility, the DS-509A boasts a 53,222-barrel cargo capacity and operates at a pumping rate of 8,000 barrels per hour (bph) with a loading rate of 10,000 bph. The double-hull tank barge utilizes a sophisticated thermal heating system that keeps asphalt at approximately 300 degrees Fahrenheit so that the highly viscous liquid remains relatively thin and flows more easily. Vane’s DS-509A has an overall length of 361 feet (110.03m) with a 62-foot (18.9m) beam. Along with transporting asphalt, which is primarily used for road construction, roofing and other building applications, the barge is generally suited for moving heavy oil products. The DS-509A is one of several new-build barges delivered recently for Vane. Earlier this year, the company welcomed the DS-501 and DS-503 into its fleet. Both 50,000-barrel barges were constructed at Jeffboat Shipyard, headquartered in Jeffersonville, Indiana. Delivery of two more 50,000-barrel barges via Jeffboat is expected later this year. Vane has also taken delivery of the DS-311, which is the fourth in an initial order of five 35,000-barrel barges from Conrad Shipyard’s Orange, Texas, facility. In addition, the DS-313 is due this fall, followed by the DS-315 and DS-317 anticipated in 2016. The Vane Brothers Company has served the maritime industry in the Port of Baltimore and along the U.S. Eastern Seaboard since 1898, providing a wide range of maritime services. Today, the company has a fleet of more than 50 tugboats and 70 barges and works out of seven locations: the ports of New York, Philadelphia, Baltimore, Norfolk, Charleston, Savannah and Jacksonville.